Glyptodonts are heavily armored grazing herbivores (plant-eaters) that evolved in South America, when it was an island continent, and when the top predators on the continent were the giant flightless carnivorous birds (Phorusrhacids) - although it is thought possible that Glyptodonts may also have been preyed on by Megatherium). Glyptodonts first appeared during the late Miocene epoch, perhaps 7 million years ago, and became extinct at about the end of the last age, probably as recently as 10,000 years ago (most likely as a result of hunting by humans). Glyptodonts are related to anteaters, sloths (including Megatherium), and armadillos. Like many of their relatives, they had no incisor or canine teeth, although they were equipped with powerful cheek teeth and muscles which would have been suitable for grinding up tough vegetation. 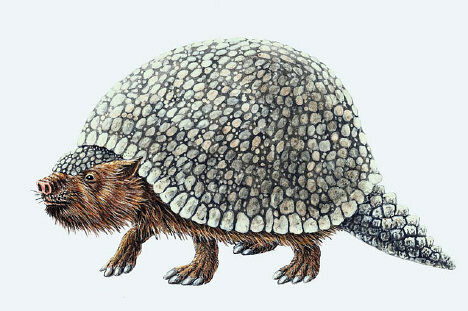 The distinctive feature of Glyptodonts is their armor. The tortoise-like shell is made from bone segments, which each species of Glyptodont having their own particular design of shell and segments. Even the tail of the animal was armored, and some species also had a mace-like projection on their tail, which they could use as a club for self-defense. The largest genus of the family, Glyptodon, was about the same size, weight, and general shape as a Volkswagen Beetle car.